Does Their Antiaging Skincare Cream Work for Sensitive Skin? These Xtend Life reviews are my personal experience of their fragrance free and paraben free skincare creams, and my opinion on their safety for sensitive skin. I was in the middle of a hugely stressful time in my life when I tested these products. I was dealing with facial breakouts and rashes that had become so bad that I had to stop all skincare products! This ended up being one of the best ways for me to really try out these products to see if they would work for problem skin. Read on to learn what happened! How Long Did We Test Them? I waited until I had three solid months of experience using the products before making a decision about this product line. In addition, several of my family members tried the Xtend-Life skincare for the same amount of time! I also had the great fortune of getting the opinion of my very hard to please husband (who also has sensitive skin). He is trying out the Xtendlife men's product line, and you'll learn what he said! I hope our experience will help you to know whether these products would be a good fit for your sensitive skin. My review will focus on the XtendLife skincare products Men's and Women's products including their Day Cream, Night Cream, Facial Masks, Cleanser and Men's Facial Serum. DISCLOSURE: I have been both a customer and an affiliate of Xtend-Life for a number of years, long before I created this website. They sent me samples of their products to review. Please see my advertising policy. Literally anything can cause a breakout, and so I've learned that it is better to keep it simple and to go very slowly, when trying any new product, skin care regime or even a new healthy food! I've found that most of my readers are the same. There's no need to use and try a zillion different products, and that usually just makes things worse! I am not a big believer in spending huge amounts of time and money trying to look different or younger than you are. I prefer to accept my age with gratitude for the gift of being here on this Earth. At the same time, like everyone, I'd like to look as good as I can! My main skincare routine, which works well for women or men of any age, is a good, clean diet, plenty of water, staying away from toxins whenever I can, and a good overall fitness program and a good quality facial exercise program. Skincare products are not the main event in my skincare regime, they are more like the "icing on the cake". This being said, the right skincare products can certainly help! Why Use Xtend Life Creams for Sensitive Skin? One of the BIG challenges of having sensitive skin is that when you get a little older and want some help to keep your skin looking good, most of the skincare products on the market contain all kinds of intense, irritating ingredients that can cause your skin to break out. Even very safe anti-aging products use a lot of strong bioactive ingredients in order to produce a positive effect on older skin, and this is often just TOO much for sensitive skin of any kind. The more I look into this, the more shocked I am at just how harmful some ingredients to antiaging skincare products can be. There are only a few product lines that I've found that are gentle and non-irritating, AND that actually produce a noticeable result on the skin. 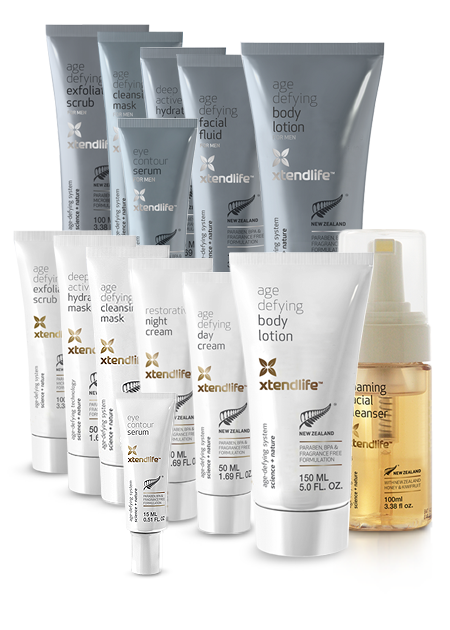 What I've discovered is that XtendLife skincare products offer a unique option for people with sensitive skin. Although their product ingredients list is not perfect in my opinion, they use just a FEW carefully chosen ingredients that product a powerful anti aging effect. For my sensitive skin, I found that this created a noticeable positive result WITHOUT skin irritation. Most, but not all of their skincare line has no added fragrance, which immediately removes additional potentials for skin irritation. In additional, all of the products are paraben free. That being said, there are some drawbacks to the products, and I'll let you know about those too. I made the sad discovery years ago that MOST popular brands of hypoallergenic products contain irritants that I wouldn't want to use on my skin. In fact, after a great deal of research, I only found ONE brand of hypoallergenic skincare that is rated safe by the Environmental Working Group. If you know of others that do not contain a lot of plant allergens, please let me know. Here are the choices I've discovered that seem to work best for sensitive skin. You can choose very safe, gentle hypoallergenic skincare products which have SOME anti-aging benefits and will not cause your skin to break out. This is my top recommendation if you're in the middle of a lot of skin breakouts. This choice will remove most plant allergens from your skincare, and help your skin to stop the cycle of breaking out from reacting to your products. For this choice I recommend the Cleure product line. Once your skin breakouts are under control, you might want to get some extra help for other areas of your skincare, for example the reduction of wrinkles and firming up of your skin. Many of us after a "certain age" begin to look for a little help in this area. Especially after age 50, most of us start looking in the mirror and going "Yikes!" I know I did! :) Once that happens, even those of us with the most sensitive of skin may be willing to explore skincare products that have some antiaging benefits. I must admit I DO appreciate when my skincare products can lighten up wrinkles and reduce that "tired" look! There are now some very nice, safe and nontoxic natural or organic anti-aging skincare products out there. These have MORE anti-aging benefits BUT also can more easily cause your skin to break out. The reason for this is that most of these have a long list of botanical ingredients, any one of which could cause your skin to break out. Generally those of us with sensitive skin do better with product lines that use fewer ingredients. I've tried many of these, and the ones I have tried that work best while also being safe and toxin free are MyChelle, which is available in the U.S., and Carolyn's Facial Fitness Skincare which is shipped worldwide. Carolyn also have developed a fantastic facial exercise program that I use every day. BUT compared to most skincare products they are relatively safe. The good news ... in my experience, they can produce SIGNIFICANT anti-aging benefits WITHOUT skin breakouts. XtendLife skincare products fill a unique place in the market of safer anti-aging skincare, as they only contain a few active ingredients, and yet they work really well. In my experience, their products are quite mild and not highly irritating to most sensitive skin. Their products have very compelling benefits and also a few drawbacks. They are not THE safest products around, but they are VERY GOOD in that department, and they produce some really stellar results, even on my face. They actually reduced my skin breakouts! I've been a customer of Xtend Life since 2007. They are a small company in New Zealand that manufactures very high quality nutritional and health products at a reasonable cost. When they developed their paraben free, mostly fragrance free antiaging skincare line, I was eager to try it out. I have always appreciated XtendLife's integrity and their passion for health. When I developed My Sensitive Skincare, I became an affiliate of their company and they are one of several product lines I personally recommend. I ONLY affiliate with companies that I trust and that I am a customer of myself! Please see my advertising disclosures page for more information on my affiliate partners. We are trained to believe that we can only have beautiful skin if we use fancy skincare products, however this is not always the case, especially when you have sensitive skin. Some skincare products can actually make our skin much worse off! 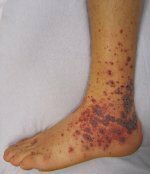 I can't tell you how many times my readers have written in and said that they got a skin rash after applying creams that were supposed to help their skin rash! For this reason, I am always VERY skeptical when trying any new product, as so many companies claim to offer products that are hypoallergenic or good for sensitive skin. The Xtend Life products do not claim to be hypoallergenic, However I found them gentle and free of most major irritants. They do contain some ingredients that I have some questions about, however they have a very good track record for producing results without causing skin breakouts. I used the products myself and gave samples to my hard to please family of sensitive skin testers, my dear husband and my Mom! It was a VERY hot and stressful summer during a bout with almost constant skin breakouts (happening in the middle of moving yet again for the third time in one year) that I was offered some samples of the Xtend life skincare products to try out.